The AUD keeps surprising and has for the second time on a row a score of 1 after upgrading the classification to "Strong". 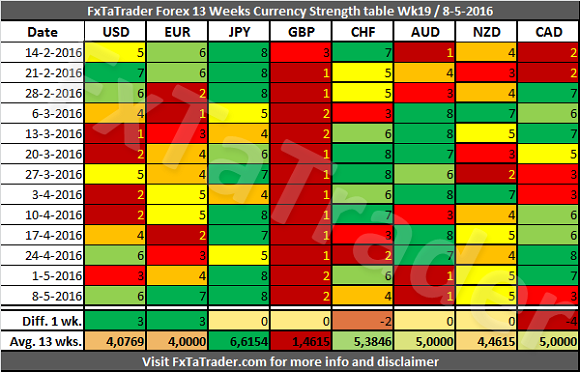 It has now the same score as the CAD but the AUD was 7 times stronger compared to the CAD in the last 13 weeks. The currency remains strong over a longer period but needs to recover soon to remain a "Strong" currency. GBP/JPY, AUD/JPY, CAD/JPY, CHF/JPY, NZD/JPY and USD/JPY. GBP/JPY, AUD/JPY, CAD/JPY, CHF/JPY, NZD/JPY. From these pairs only the JPY pairs seem to be interesting according to the combinations mentioned in the crossed join here above. 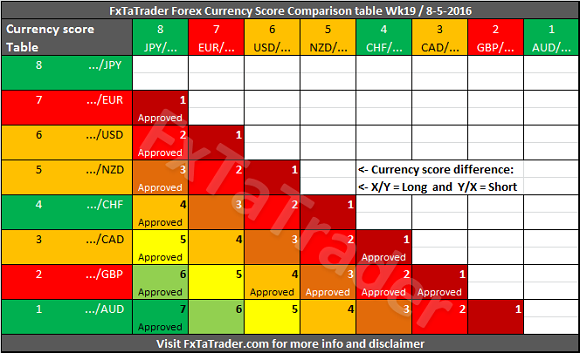 Same is the case if we compare these pairs only with the "Currency Comparison Table".